In this year’s Gulf Film Festival out of the 155 films chosen, five short films were selected for the competition is produced by the UAE based company, Dhabi Gulf Films. Converting ideas into visuals is what every film makers aims to achieve, but the Producer and General Director of Dhabi Gulf Films, Ali Almarzouqi believes it’s much more than that. 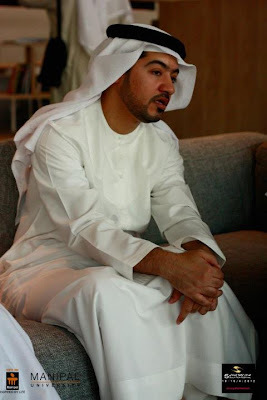 “Through films we discuss real issues with the community and use advance techniques in technology to make nice pictures with those nice ideas,” said Ali Almarzouqi. He is the producer of 5-short films which have been selected and screened at the 5th edition of the Gulf Film Festival, some of which are Maktoob by Rawia Abdullah, Untruths by Ibrahim Almarzouqi and Ice cream by Khalid Al Abdulla. The Gulf Film Festival 2012 is here once again to prove itself and break boundaries as it continues to be a platform for promoting local talent in film-making that prevails in the region.